A bill that could weaken Michigan’s long-standing campaign contributions limits has received the approval of Gov. Rick Snyder. The Michigan Senate voted 23-12 for Senate Bill 335 on Thursday. 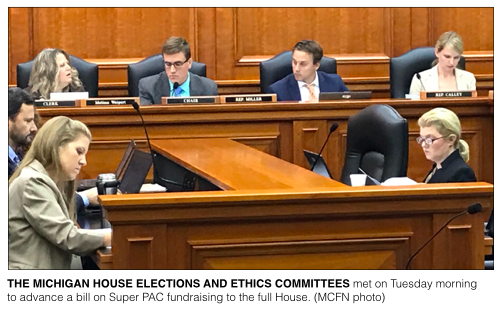 On Tuesday morning, the Michigan House Elections and Ethics Committee advanced the bill to the full House, where hours later, representatives voted 62-45 in favor it. On Wednesday, Snyder the legislation into law. Supporters of the bill have included Michigan attorneys Robert LaBrant and Eric Doster. LaBrant has had a long career in election law and published a personal memoir entitled “PAC Man” in 2015. Doster has been the longest serving general counsel in the history of the Michigan Republican Party, according to his firm’s website. Representatives of the Michigan Chamber of Commerce and the Michigan Farm Bureau have also stated their support for the bill. The Michigan Campaign Finance Network has testified in opposition to the bill. Representatives of the League of Women Voters of Michigan and the Sierra Club have taken positions against the bill along with numerous individuals, according to committee minutes. Supporters have argued that the bill codifies the Supreme Court’s 2010 Citizens United court decision. The bill goes further, specifically allowing candidates to solicit unlimited contributions to supposedly “independent” Super PACs. It also allows candidates and Super PACs to share certain vendors, like attorneys or other campaign consultants. So while an individual donor can give up to $1,000 to a state House candidate’s campaign. The candidate could ask the same donor or a corporate entity to give a much larger check to a Super PAC that is going to support the candidate. Because Super PACs can accept corporate contributions, the original sources of their money are notoriously hard to trace. Michigan’s campaign contribution limits date back to the 1970s when Gov. William Milliken championed a wide-ranging ethics reform proposal in response to the Watergate scandal. Yes votes (23) — Darwin Booher (R); Jack Brandenburg (R) Tom Casperson (R); Pat Colbeck (R); Judy Emmons (R); Mike Green (R); Goeff Hansen (R); David Hildenbrand (R); Ken Horn (R); Joe Hune (R); Rick Jones (R); Marty Knollenberg (R); Mike Kowall (R); Peter MacGregor (R); Jim Marleau (R); Arlan Meekhof (R); Mike Nofs (R); John Proos (R); David Robertson (R); Wayne Schmidt (R); Tonya Schuitmaker (R); Jim Stamas (R); and Dale Zorn (R). No votes (12) — Jim Ananich (D); Steve Bieda (D); Ian Conyers (D); Vincent Gregory (D); Curtis Hertel (D); Morris Hood (D); Hoon-Yung Hopgood (D); Bert Johnson (D); David Knezek (D); Margaret O’Brien (R); Tory Rocca (R); and Rebekah Warren (D). Yes votes (62) — Chris Afendoulis (R); Thomas Albert (R); Julie Alexander (R); Sue Allor (R); Tom Barrett (R); Joseph Bellino (R); John Bizon (R); Tommy Brann (R); Julie Calley (R); Edward Canfield (R); Lee Chatfield (R); Triston Cole (R); Laura Cox (R); Kathy Crawford (R); Diana Farrington (R); Ben Frederick (R); Daniela Garcia (R); Gary Glenn (R); Joe Graves (R); Beth Griffin (R); Roger Hauck (R); Shane Hernandez (R); Michele Hoitenga (R); Pamela Hornberger (R); Gary Howell (R); Holly Hughes (R); Brandt Iden (R); Larry Inman (R); Steven Johnson (R); Bronna Kahle (R); Tim Kelly (R); Klint Kesto (R); Beau LaFave (R); Kim LaSata (R); Dan Lauwers (R); Tom Leonard (R); Eric Leutheuser (R); Jim Lilly (R); James Lower (R); Peter Lucido (R); Steve Marino (R); David Maturen (R); Mike McCready (R); Aaron Miller (R); Jeff Noble (R); Dave Pagel (R); John Reilly (R); Daire Rendon (R); Brett Roberts (R); Jim Runestad (R); Jason Sheppard (R); Jim Tedder (R); Lana Theis (R); Curt VanderWall (R); Scott VanSingel (R); Henry Vaupel (R); Rob Verheulen (R); Roger Victory (R); Michael Webber (R); Jason Wentworth (R); Mary Whiteford (R); and Jeff Yaroch (R). No votes (47) — Winnie Brinks (D); Wendell Byrd (D); Darrin Camilleri (D); Stephanie Chang (D); John Chirkun (D); Cara Clemente (D); Tom Cochran (D); Scott Dianda (D); Fred Durhal (D); Brian Elder (D); Jim Ellison; Pam Faris (D); LaTanya Garrett (D); Sherry Gay-Dagnogo (D); Erika Geiss (D); Patrick Green (D); Chris Greig (D); Vanessa Guerra (D); Abdullah Hammoud (D); Kevin Hertel (D); Jon Hoadley (D); Martin Howrylak (R); Jewell Jones (D); Robert Kosowski (D); David LaGrand (D); Donna Lasinski (D); Frank Liberati (D); Leslie Love (D); Jeremy Moss (D); Sheldon Neeley (D); Kristy Pagan (D); Ronnie Peterson (D); Phil Phelps (D); Yousef Rabhi (D); Rose Mary Robison (D); Terry Sabo (D); Sylvia Santana (D); Andy Schor (D); Bettie Scott (D); Sam Singh (D); Tim Sneller (D); Bill Sowerby (D); Robert Wittenberg (D); Henry Yanez (D); and Adam Zemke (D).